Dua pekan lalu, dunia pariwisata Indonesia dibuat gondok oleh kehadiran sebuah tempat hiburan baru di Bandung, bernama Rabbit Town. Pasti udah pada tau, ya, kenapa tempat ini bikin gondok. Tadinya gue berniat menulis artikel tentang Rabbit Town untuk The Jakarta Post, tapi... ah, udah banyak artikel yang nulis tentang tempat itu, ya? Akhirnya gue mengangkat sudut pandang yang dekat di hati gue: narsisisme (kosong) yang terpicu oleh medsos berbasis foto, berhubung efeknya jadi melebar kemana-mana. Yha, termasuk pariwisata. Kayaknya opini gue "mengena" di hati banyak orang, sehingga artikelnya jadi... duh, mau ngomong viral tapi kok malu. Anyway, banyak tokoh idolaque yang membagikan artikel tersebut, termasuk Mbak Trinity dan Mbak Sasha. I couldn't be more humbled. How was your Easter weekend holiday? Did you go somewhere interesting? Hopefully it’s not Rabbit Town. By now, you must have heard about the newly opened Rabbit Town in Bandung, West Java, but not for the right reasons. Only two months after its soft launch, Rabbit Town has caused controversy for appearing to plagiarize three iconic contemporary art installations as their “attractions”, without any recognition of the original artists whatsoever. The installations are Chris Burden’s Urban Lights, Yayoi Kusama’s Obliteration Room, and parts of the Museum of Ice Cream in United States. Chris Burden’s Urban Light at the Los Angeles County Museum of Art (LACMA) is a large-scale installation made up of 202 functioning lampposts, and Rabbit Town created a similar version named Love Light. 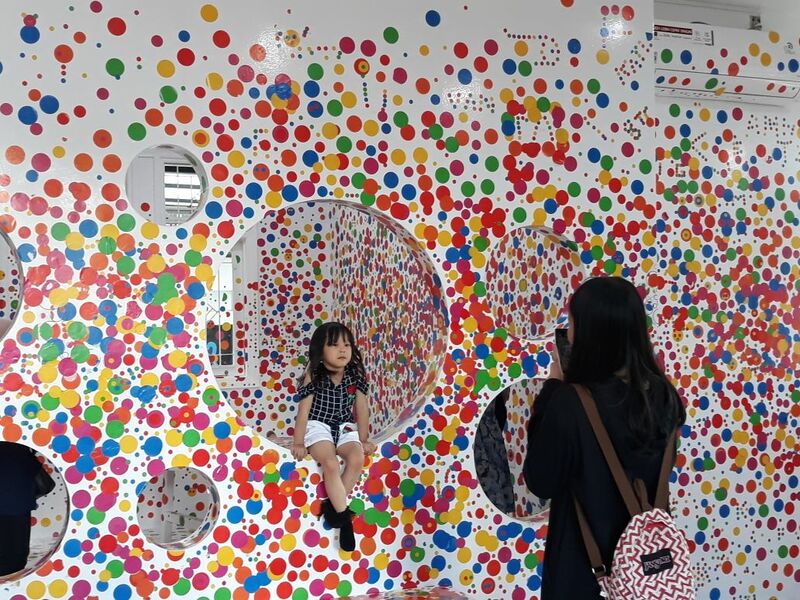 In Yayoi Kusama’s Obliteration Room, visitors are encouraged to gradually transform an all-white room by placing colorful dot stickers all over the space, and you can do the exact same thing in Rabbit Town’s Patrico Sticker. Moreover, if you have been wanting to visit the super popular, super Instagrammable Museum of Ice Cream in United States, no fret. Rabbit Town has carbon copies of it, too! Rabbit Town’s major motivation for their alleged piracy seems to simply make themselves an Instagrammable destination, rather than to evoke visitors’ awe and contemplation with contemporary artworks. 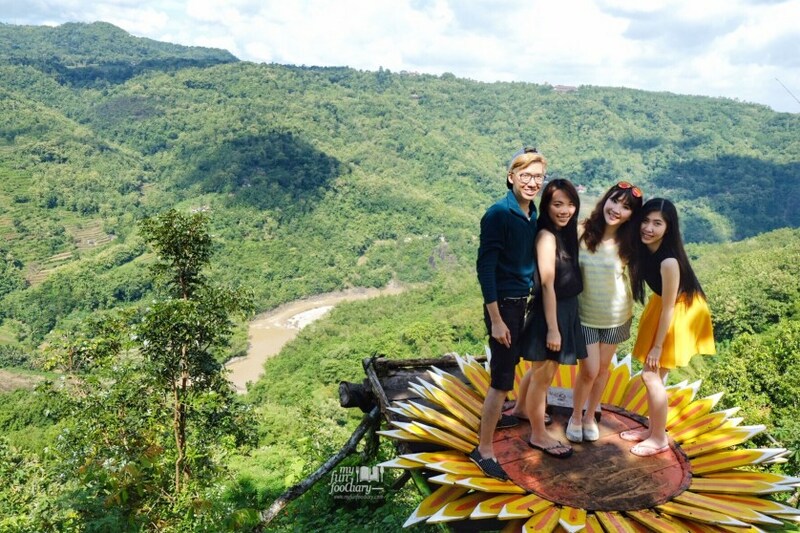 In fact, they proclaim themselves as a wisata selfie (selfie tourism) destination, and they offer almost no other experience but giant photo backgrounds. Rabbit Town is the creation of Henry Husada, the chairman and CEO of the hotel management company Kagum Group, which holds Museum Rekor Indonesia’s record in 2014 for having 15 new hotels launched at the same time. Rabbit Town was named after Henry's zodiac sign, and the property was originally his private mansion. So it is safe to conclude that Henry Husada is rich and able to commission Indonesian artists to create original artworks for Rabbit Town—then thus sustains the local art scene—instead of plagiarizes and disregards the ripped-off artists’ intellectual property. Ever since the news went viral, many Indonesians have been angered. Comparison photos with mocking captions swirl around the internet, and the Rabbit Town’s Instagram page was flooded with angry comments. I said “was”, because shortly after it came under attack, Rabbit Town closed its comment section and blocked anyone who mentioned LACMA, Yayoi Kusama, or the Museum of Ice Cream. There are many reasons why people are pissed off. Some people are insulted because Rabbit Town assumed they wouldn’t know Urban Lights nor Yayoi Kusama, while others are annoyed because Rabbit Town gains profit from using artworks from living, productive artists (currently, Rabbit Town charges Rp25,000 per visitor). But many are irritated because essentially, Rabbit Town humiliates Indonesia. Indonesia is thriving. Not just economically, but also culturally. The middle class is growing stronger, more educated, more well-traveled, and more culturally knowledgeable than ever. However, Rabbit Town’s alleged plagiarism embarrassingly gives the impression that Indonesians are lazy, ignorant, uncultured, thus invalidating our previous endeavors. Rabbit Town’s alleged plagiarism might have occurred because Henry is simply ignorant, but it might also be because he realizes the lucrativeness of monetizing selfies and narcissism. Today, it seems that selfies and narcissism are the root of evil in Indonesian tourism. Why? First of all, tourists’ love of selfies degrades travel destinations. The experience that the place has to offer is no longer significant, because all people care about is how photogenic or Instagrammable the place is. Today’s tourists don’t notice the wonderful fresh-smelling air in a pine forest they walk through, nor do they care about the rich history of ancient ruins they visit. Their main focus is whether the place will make their photos look aesthetically pleasing, and how many likes will they garner on social media. A couple of years ago, I went to Copenhagen. During a relaxed afternoon stroll at Nyhavn, I came across another family from Indonesia—a young set of parents, and their toddler daughter. They looked rushed, tired, half running with their selfie sticks. We chatted a bit and I asked them about their travel. They told me that they are on whirlwind tour across Western Europe for two weeks, but spending only two days in each city or country. “Isn’t that exhausting?” I asked. Then off they went with their daughter in tow, who struggled to catch up with her parents. I wondered what would be the little girl’s early memory of Europe. Would she remember having a relaxed picnic in Hyde Park with her parents? Would she remember the mesmerizing tale of The Little Mermaid from Denmark? Sadly, she would probably only remember running around catching the next flight or train, and being forced to smile for pictures. Second, with the growing narcissism that is fueled by image-heavy social media, tourists today become caught in their own bubble—oblivious and ignorant. Therefore, along come issues such as unethical "dark tourism"... and broken artworks. Just recently Indonesian singer Syahrini was flamed because she took ignorant, very self-centered selfies at the Holocaust Memorial in Berlin. Only last year that I witnessed a multi-million rupiah sculpture in Galeri Nasional Jakarta got accidentally knocked over and almost crashed to pieces by a bunch of teenagers who tried to take selfies in front of the artwork. 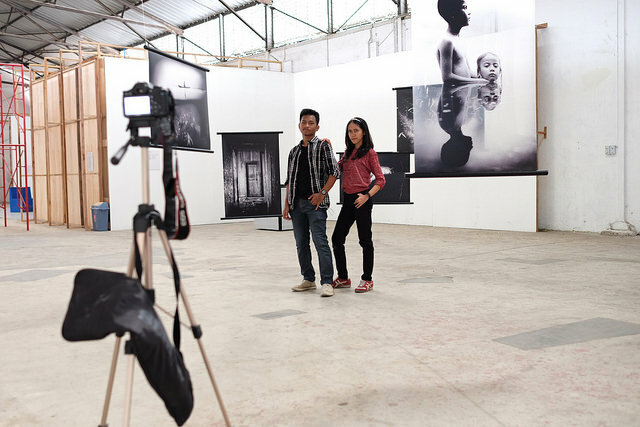 Unfortunately, Indonesians do tend to rush to take pictures, once they stepped foot inside an art exhibition. Only little care to stop, look, and try to understand the art displays first. Thirdly, aesthetic photos are undeniably an effective marketing tool for the tourism site, but this isn’t always a good thing. When stunning images go viral, they can release a horde of tourists eager to get a copycat photo. Hence, developers now focus more and more on the aesthetic aspects of their tourism site, not the experience it can give, nor the whole quality of the place. As long as the place has photogenic points here and there, it is enough. Take a look at Rabbit Town, whose main selling point is its photo backgrounds, and almost nothing else. Moreover, if we go to natural-tourism sites such as Mount Merapi in Central Java, Maribaya in West Java, Mangunan and Imogiri Pine Forest in Yogyakarta, we see numerous photo platforms or photo backgrounds being erected by locals, who charge visitors Rp 5,000 (less than 50 US cents) to Rp 50,000 to have their pictures taken there, usually against the breathtaking landscape. Sometimes this photo-op “facility” overshadows or even sacrifices the real experience of the site. For instance, Kalibiru Tourism Village near Yogyakarta redesigned their zip-lines and treetop platforms into a fully fledged photo-op destination. However, such photo destinations often become very successful. Shelly Banjo from Bloomberg reported that in Kalibiru, waiting times now stretch to six hours on popular days, prompting a nearby village to raise about US$100,000 to build a second photo destination in the protected forest. Earlier this year, about 7,000 tourists visited the two sites each week. To conclude, even locals understand the lucrativeness of monetizing selfies and self-narcissism. Nowadays, photogenic attractions are popping up across Indonesia, as today’s travelers increasingly compete via social media to show off their experiences. They don’t just want to see, but also to be seen. Promotion and Event Supervisor from Taman Impian Jaya Ancol Dian Komalajaya stated that according to the latest Nielsen survey, people’s motivation to save up today is to have a holiday, as it has become an integral part of their lifestyle. People also tend to visit trending or Instagrammable places, and selfie spots have become important aspects of the destination. Google “wisata selfie” and you will find numerous Indonesian articles that dub tourist sites as “selfie destinations”, meaning the places are photogenic and fun to take photos in, but that’s all there is to them. Yes, there are exceptions, such as the ever-so-charming Ulen Sentalu in Kaliurang, Central Java, which still manages to be an ultra-popular travel destination although they don’t allow photography inside their property. Nevertheless, few other destinations are as confident as Ulen Sentalu, since churning out appealing photos has become the main—if not only—objective for most tourists visiting a place. Why would tourist destination developers want to waste money and effort to create immersive, interactive experiences if they can attract crowds using only photo backgrounds? And why would they care about design concept or originality? Henry Husada’s group surely doesn’t. I once worked in tourism as part of the creative team to develop the concept of a local amusement park. Our CEO openly claimed that he didn’t want to create too many original elements for the park, because it’s tough to successfully permeate people’s mind with new branding. In order to sell fast, he felt that we needed to just copy other brands that were already well-received. For example, the amusement park’s theme song imitated one of Disney’s iconic songs, with slight changes in its tempo and a few of its notes. Initially, I tried to arrange collaboration with one of Indonesia’s top composer to create an original score, but the boss rejected the idea. He believed it would be too costly, but not effective. Did imitating the theme song prove to be effective? Yes, it did. I randomly asked visitors what they thought about the song, and they claimed that they enjoyed it—even felt it evoked warm feelings—because they felt very familiar with the scoring, though couldn’t exactly pinpoint why. Reflecting on that experience, it isn’t surprising that Rabbit Town ignorantly made crass copy of other people’s artwork. Like some other local tourist site developers, Rabbit Town probably thought they could get away with it. Besides, there would always be people who would see that plagiarism is still “tolerable”, proven by some commenters in Rabbit Town’s Instagram who thinks that Rabbit Town’s act was harmless. 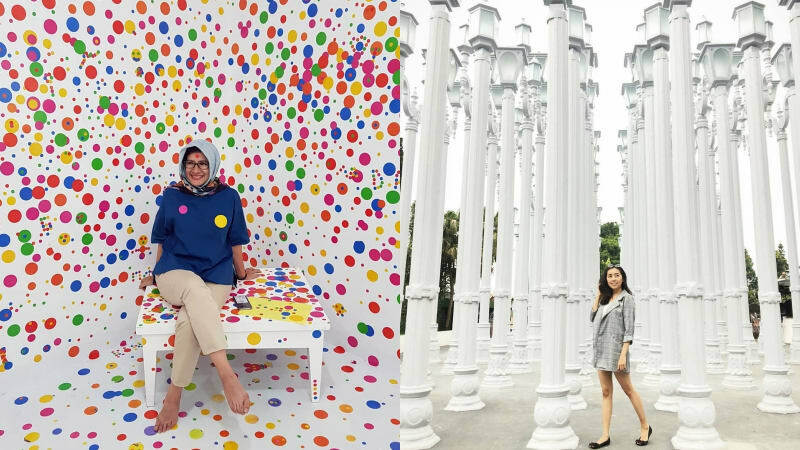 In fact, it seems that some locals are thankful to Rabbit Town for making Museum of Ice Cream, Yayoi Kusama’s and Chris Burden’ artworks “more accessible” for Indonesians. It is highly doubtful that Rabbit Town has such intention, though. Most likely, all they wanted is to have catchy backgrounds for selfies and instant buzz on social media, with as minimal cost for original creativity as possible. Rabbit Town might shame us Indonesians, but rather than flaming them on its social media, it’s more effective to not acknowledge the place at all. What’s most important is to be mindful and aware of our recreational trips. No matter how appealing the viral photos are, ask ourselves this before visiting a place: if we couldn’t take pictures there at all, would we still want to go? Would the place still be interesting? What experiences can they offer? Gue sempet punya pengalaman soal turis-turis selfie ini di Singapore Art Science Museum, tepatnya di Crystal Universe. Masuk ke instalasi itu waktu itu sampe antre, padahal museum lagi gak rame-rame amat. Setelah gue masuk, ternyata yang bikin lama adalah orang-orang yang foto-foto di instalasi itu. Mereka sibuk foto berkali-kali take demi dapet angle yang bagus. Buat mereka instalasi itu cuma sekadar background, tanpa berusaha merasakan apa yang pingin disampaikan si seniman lewat karyanya. Secara hiperbolik, menurut gue indra, rasa, dan pengalaman mereka cuma seluas kotak tempat foto mereka tampil, entah itu di Instagram, Facebook, atau media sosial lain. Kalau jalan-jalan harus foto-foto, doong :) Tapi menurut gue, pepotoannya sadar diri aja. Misalnya, nggak merongrong satu background foto utk 100x jepret, sementara banyak orang ngantri di belakang kita. Atau, nggak berisik minta pelayan fotoin kita di restoran, sementara restorannya lagi sibuk dan para pelayan harus melayani para pelanggan lain.